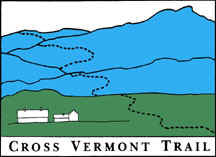 The Cross Vermont Trail statewide route currently includes many miles along roads, as well as many road crossings. Traffic on the road has the right of way, when a section of path junctions with a road. Always stop at an intersection with a road, if you are on a path. Wait for a safe break in traffic before entering the road. Wait for a break in traffic. Go straight across the road (not on a diagonal). If there is a sign or pavement paint designating a crossing location, use that location. If there is a light controlled "walk signal", follow the signaled instructions. Use sidewalk if available. If no sidewalk, then walk along the side of the road facing traffic. (Easy to remember, you want to see the cars coming towards you!) Stay as far to the side, as far out of the traffic lane, as practical. The upshot is that bicycles are vehicles, and should ride on the road the same as any vehicle. If you know the rules of the road for cars, then you know the rules of the road for bicycles. Ride with Traffic. Always ride on the right side of the road. Ride as far to right as practical. If there is a wide, smooth shoulder, you may be outside of the automobile travel lane. More often the shoulder is too narrow (or too rough) to allow this. In which case it is safer to ride within the regular lane of traffic (though still on the right hand side). It is legal to ride two abreast as long as you are not blocking other traffic. Be Predictable. Drive your bicycle in a smooth and predictable manner. Use hand signals to indicate turns. Obey All Traffic Laws. Bicycles have the same rights and responsiblities as any vehicle and must obey all traffic laws, including stop signs and traffic signals.